Brady Ryan grew up on San Juan Island with a love of the beautiful waters of the island and fresh local products. He has returned to his roots to create San Juan Island Salts from the filtered seawater and sunshine. Rich in minerals including calcium, magnesium, & potassium, the salt will taste the freshness of the sea. San Juan Island Sea Salts are made with great care and patience. 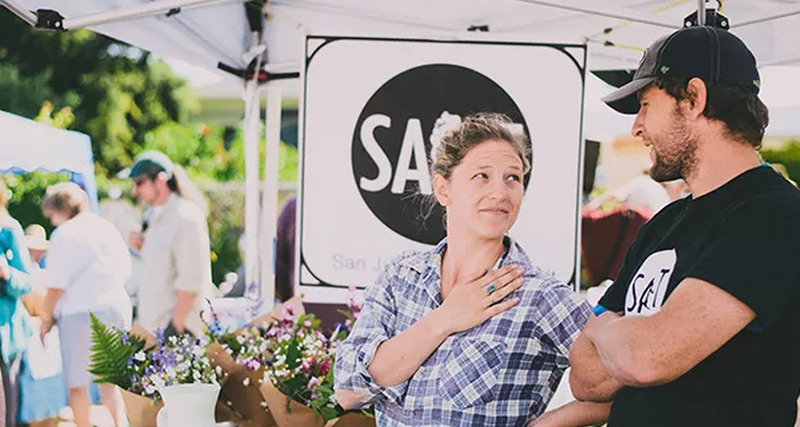 Here are a few insights and tips from Brady on the benefits of San Juan Island Sea Salts and how to use it. – The salt is solar evaporated and hand harvested in unheated hoop-houses making the process completely driven by the sun. – The seawater is allowed to completely evaporate, bringing in the whole mineral wealth of the sea to broaden the flavor. – The sun powered evaporation is quiet, seasonal and low input. Contract that with boiled salt, which can take as much as 2 lbs of liquid fuel too make 1lb of salt. – The salt comes out of the evaporation houses very coarse, so it is ground. The consistency is similar to Fluer de Sel. – Clumping or caking is completely natural for sea salt, if this happens a couple of whacks of the jar against your palm should be enough to loosen it up again. – Store the salt in closed containers to keep the moisture from the air out.